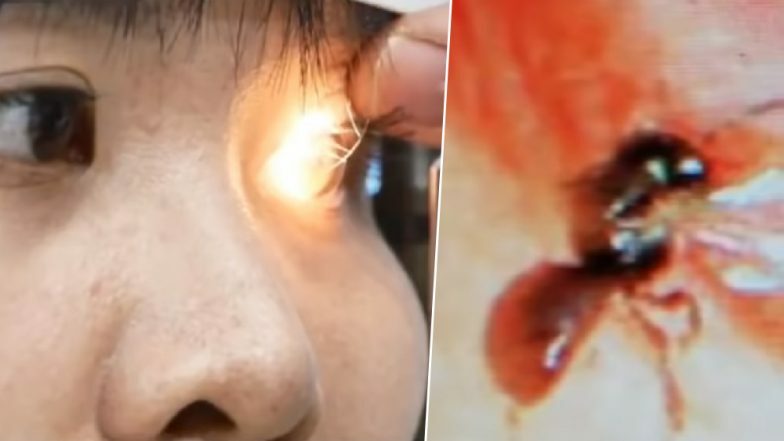 Doctors Remove 4 Bees From Taiwanese Woman's Eyes That Were Feeding on Her Tears, Watch Terrifying Video! Eye infections can be very irritating and for a woman in Taiwan, it turned into a terrific nightmare. What she thought to be a simple eye infection was actually turning into a beehive! The woman had four bees living under her eyelids and feasting on her tears. Identified just as Ms He, she is now recovering after the doctors removed all the bees. The bees also caused an infection and she could have even gone blind, had it escalated. Doctors Removing an Ant From Vietnamese Man’s Ears Will Make Your Stomach Churn (Watch Video). Ms He had visited a graveyard of a family member during the country's annual day of honouring the dead, the tomb sweeping festival. While she picked up some weeds there, something stung her eye. She tried washing the foreign object but it only got worse. She experienced serious pain and her eye began to swell even more. She was quoted to local media, "It was a very intense stinging pain and I was constantly shedding tears, there was a lot of secretion." The doctors who treated on her were also shocked when they saw there were bees under her lids! Man Drives Truck for 65 Kilometers With 3000 Lose Bees Inside, Takes a Video and Jokes About It! It is horrible to even think of what the woman must have gone through. The doctors were shocked that there was not one but four bees underneath. They were really tiny bees, known as the metallic bees and would feed on the woman's tears. The woman had got a severe bacterial infection as well. What's even more shocking is she did not rub her eyes despite experiencing such pain. The doctors informed BBC, "She was wearing contact lenses so she didn’t dare to rub her eyes in case she broke the lens. If she did she could have induced the bees to produce venom… she could have gone blind." The woman's eyesight had decreased to almost 10% than her normal eyesight. The doctors removed the bees one by one and she is currently recovering.